Oh gosh it feels really weird to be more then halfway through the year! I feel like I haven’t gotten much done so far, not nearly as much as I wanted too, but i’ve learned a lot and i’m proud of the things I have done. Hopefully the rest of this year will prove to be even more productive! This is my second progress report, and this time i’ll be talking about what I got done in July and what I hope to do in August! Last month I went on about my many works in progress, and i’m happy to say that I completed three projects and made a little bit of progress on two others! I’ve also started a youtube channel, which has been really scary but exciting! I’ve wanted to make videos for a long time but they scare me a lot, I’m always really concerned about what other people will think and a video seems so much more revealing then a blog post or photoset. So far I’ve enjoyed the editing process a lot and hopefully I can continue with the process. I updated my portfolio site which should have happened a long time ago, I still have more to do, but it’s in much better shape then it was a month ago! This month i’m going to get wordpress updated and try and get rid of any “page under construction” warnings that have been floating around for ages. I’d also like to resume my “Workspace Wednesday” series, but do it in videos instead of blog posts. As for projects, I started and finished the companion piece to my Dewdrop dress and got photos of the completed pieces. This dress went together really quickly and I like how it came out! I’m also very pleased by the photos, they turned out a lot better then I had hoped they would. I liked these pictures so much that I made a new banner and color scheme for my tumblr – the old one had been around for 7 months so it was time for a change! 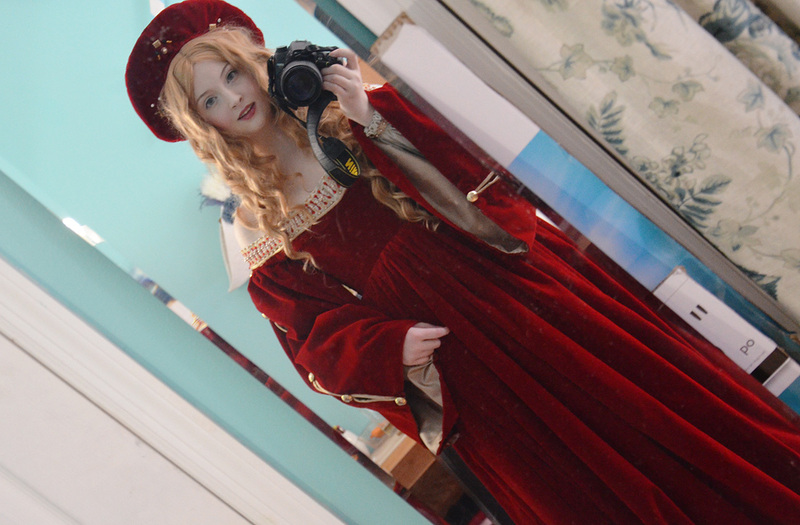 I finished my Isabel de Requesens costume which I will be talking more about in an upcoming blog post! 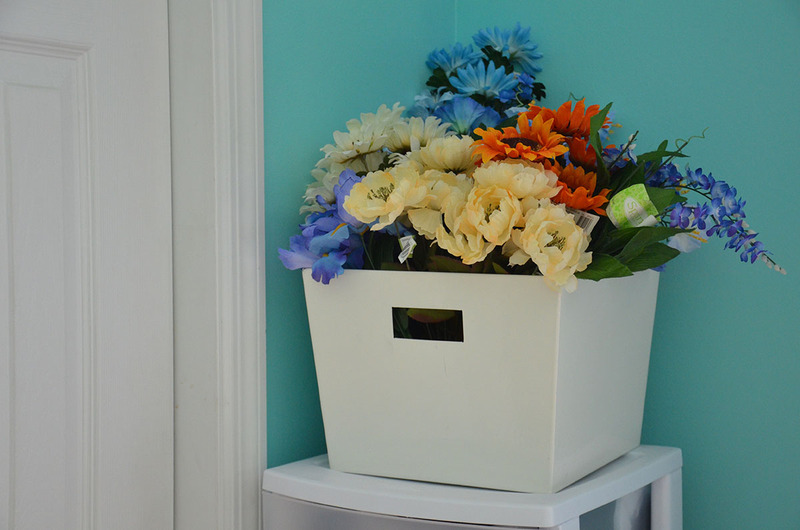 This was the biggest project i’ve taken on since Elsa and it’s been strange not having it around my workroom. I worked on it a little bit every day for almost a month, so I miss it! 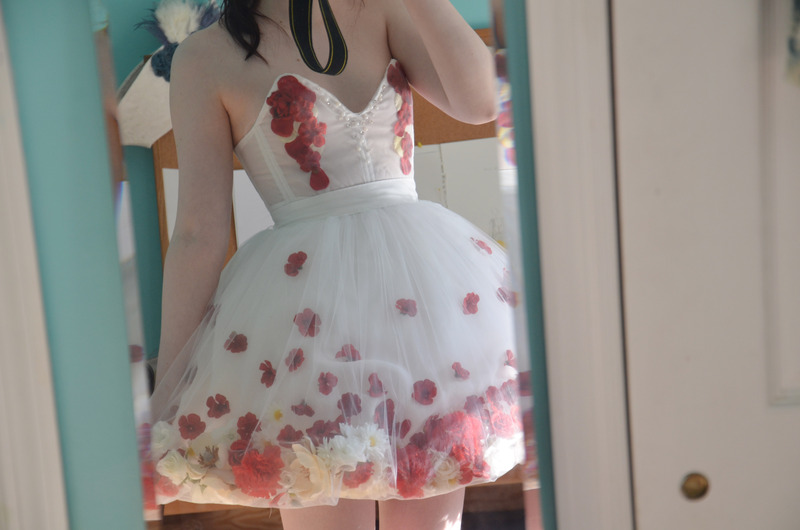 I also started and finished my flower dress! This didn’t come out quite how I had hoped, but I think it’s cute and I’m glad I made it. 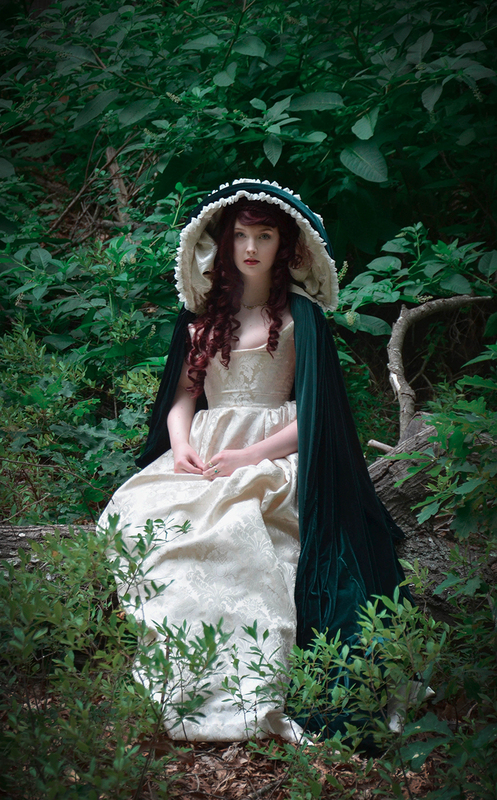 Unfortunately my Regency dress and 18th century stays didn’t get finished. The stays just need the edges bound, then they’ll be done, but that has proved to be far more difficult then I had expected. 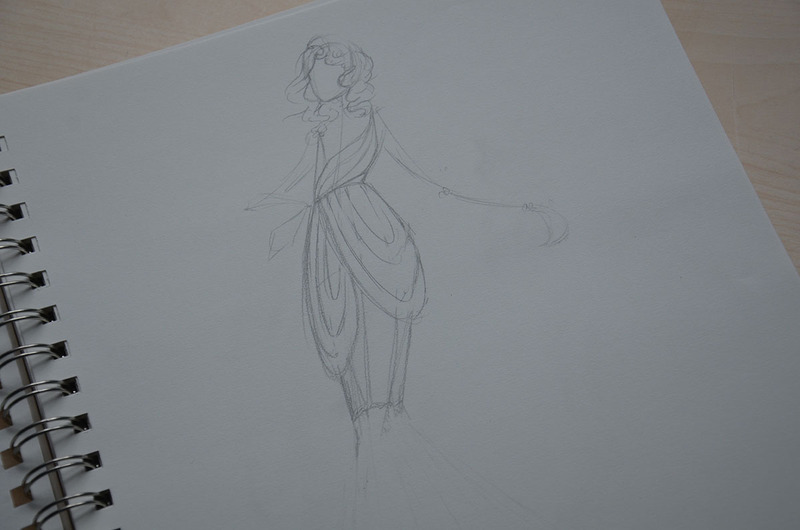 I got the bodice of my Regency gown cut and sewn, but i’m still not feeling very excited or committed to this project. It’s definitely not a priority of mine right now but hopefully I’ll make a little more progress this month! Onto recent purchases! 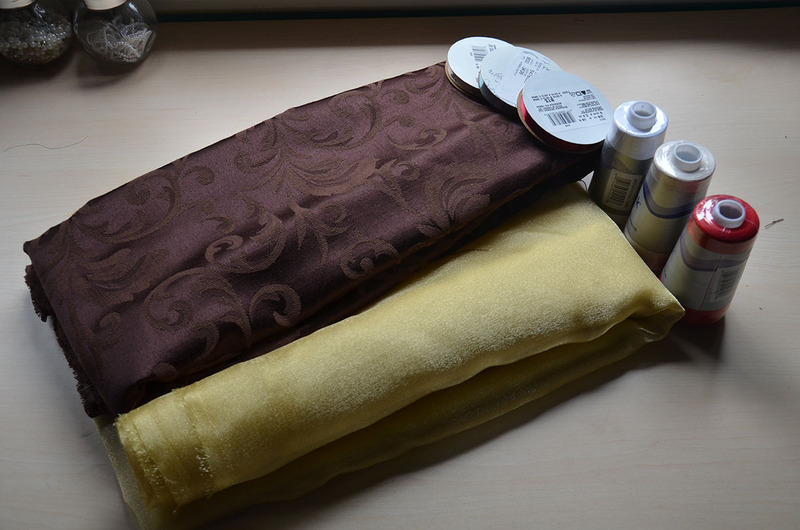 It had been almost two months since I had bought any fabric…which is a long time! The last fabric I purchased was for my birthday, then I put myself on a ban. I was determined to use up materials I already had, and I did, I’ve used nearly 50 yards of material from my stash in two months, which is kind of crazy! Since July was student month at Joanns I had piles of coupons and decided that the ban should be lifted. I needed organza for an 18th century project, ribbon for lacing, and white/off white thread. Home decor fabrics were on sale too, so I picked up a bit. 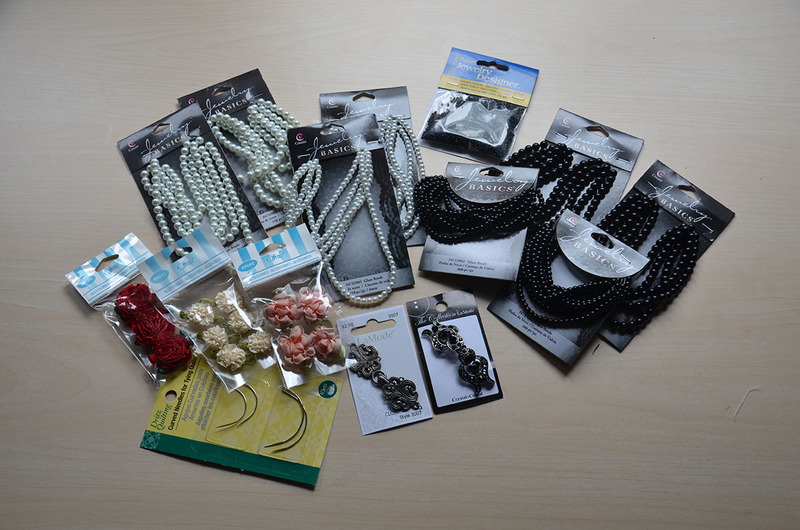 I also go lot’s of fake pearls and ribbon flowers! I only started one project this month, and i’m not sure if i’ll finish it. After making the flower dress I had a ton of left over leaves, so I decided to put together a little jumpsuit using the same technique and the poofy shorts pattern I made months ago. I’m not sure what I think of this idea or if i’ll ever complete it, but it is technically in progress. My goal for the coming months is to show more variety in my work. I think i’m going to create a few less historically focused original designs. I would also like to make several looks inspired by menswear, including a 17th century doublet, court suit (1800s inspired), velvet suit (1800s inspired), and perhaps another frock coat/tunic combo. I’m really torn about what to make first and which fabrics to use, but I’ve been playing around with designs a lot! I think I might start with a frock coat and matching trousers, but i’m not sure what fabrics and trims to use. Here are two combos that I really love, But i’m not sure if they are exciting enough. I’ve saved the very best for last – I’ve started work on a butterfly inspired project. 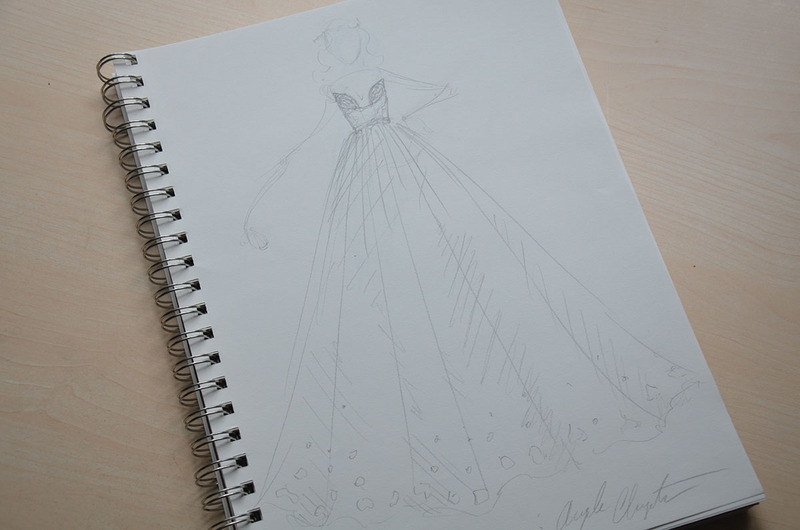 It will feature a giant cloak with monarch butterfly wing patterns painted on the interior, a draped chiffon dress, a tulle ball gown, and potentially a bodysuit. 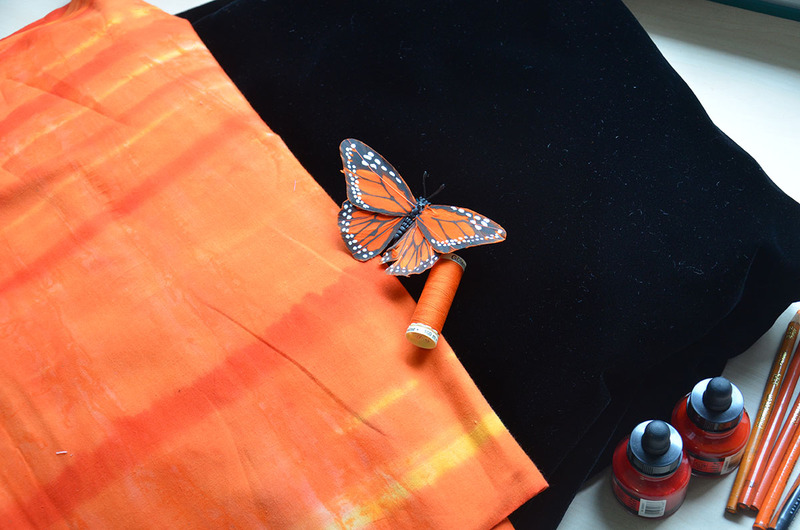 I picked a black velvet and orange batik for the cloak, along with acrylic and watercolor paints which i’ll use to create more depth. I’ve decided on two dress designs that i’m really pleased with, unfortunately I couldn’t find the fabrics I need in stores so i’ll need to make an online order and wait a bit before starting on these. In the mean time i’ll be making the patterns and working on the cloak. So that’s what I have on the agenda for this month! Hi Angela, I adore your work – you’re amazingly talented! 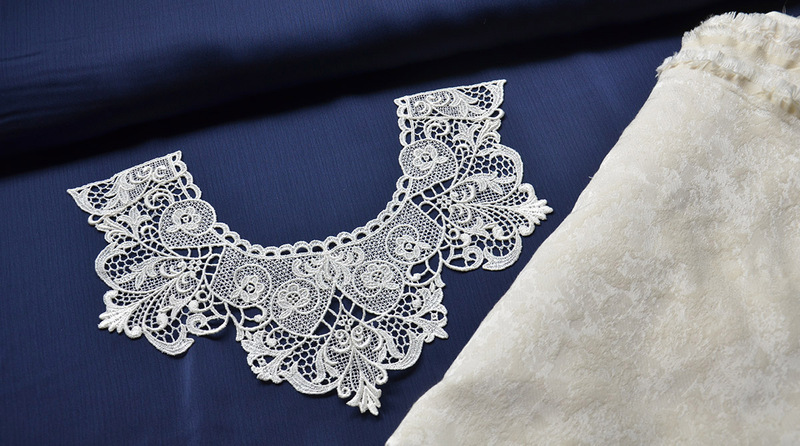 Would you happen to know of any good resources for someone who is interested in starting dressmaking? 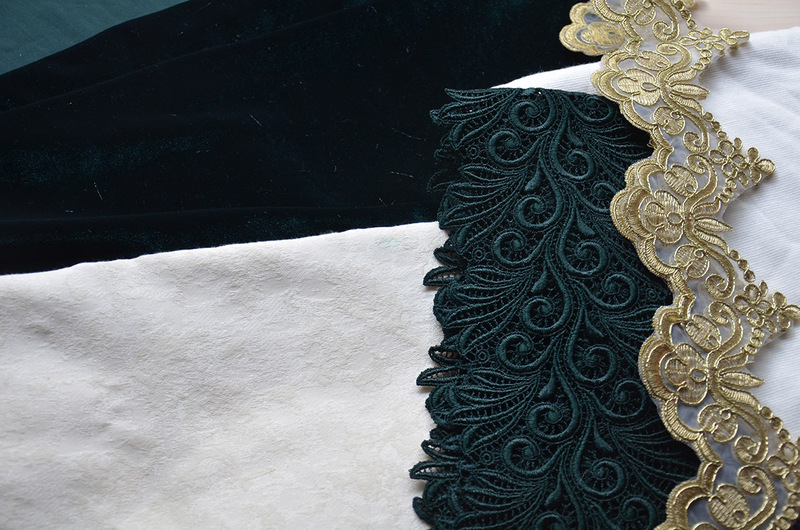 I really like the green velvet and gold combination for the frock coat, and that monarch project is going to be incredible! 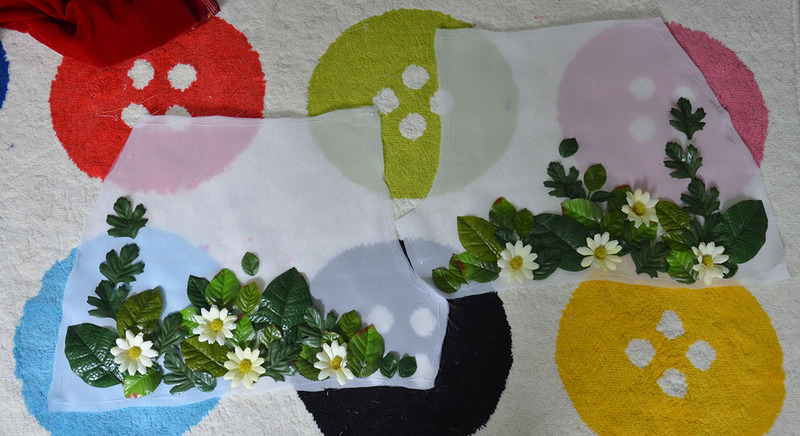 I love the layout of the leaves and daisies on the poofy shorts…. I’d love to see what they look like finished. 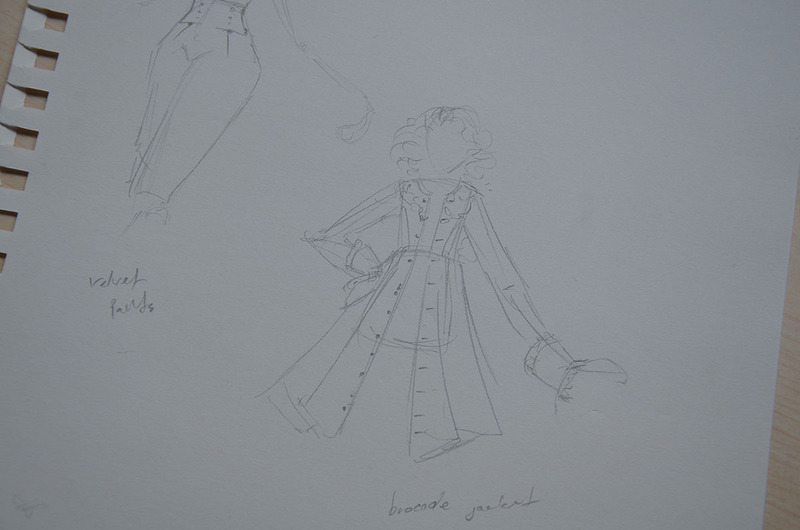 I like the second set of fabrics for the frock coat and trousers. The monarch project is going to be lovely!! Best of luck with your new projects! I will be looking forward to seeing the progress!